What are Better Late Than Never reviews? These are games that are too recent to be retro but too old to be considered completely new. SuperPhillip Central does its best to deliver timely reviews, but sometimes there are just too many games out there and too little time. This review is special because our good friend and part time staffer Bean has this review under control. 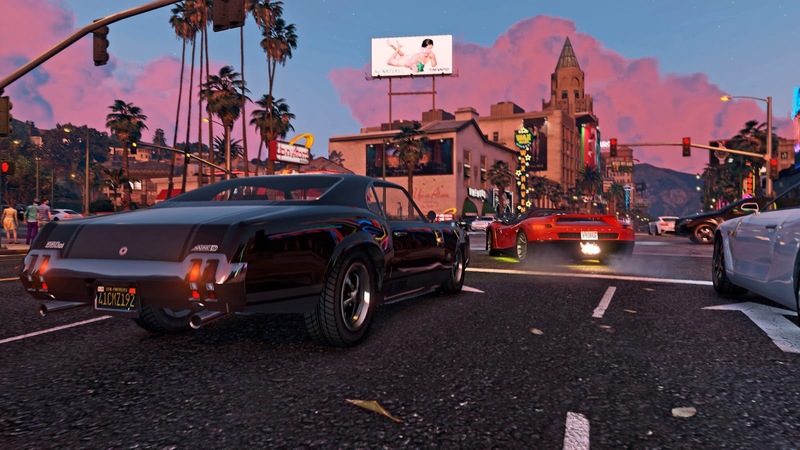 Here's his judgment on Grand Theft Auto V.
Grand Theft Auto came into its own back on the PlayStation 2 with some well-regarded classics that included Vice City and San Andreas. 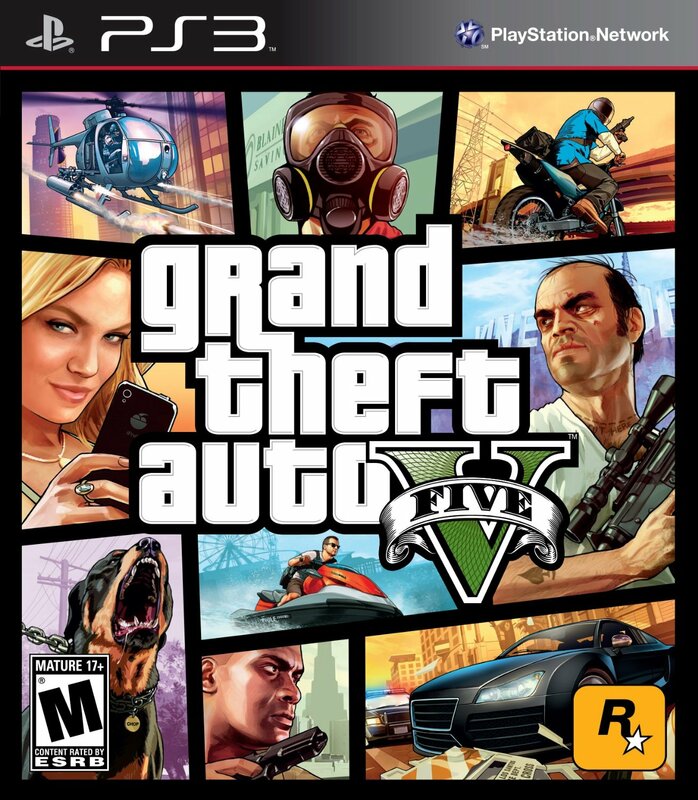 However, when the series moved the 7th generation of systems in 2008 with Grand Theft Auto IV, something felt off. The many extras that had been included in the PS2 games were noticeably absent from the new Liberty City sandbox. To make matters worse, the game tried to play off with a more serious tone that did not work to its benefit with atrocious characterization and a stunning lack of mission variety. While Rockstar would try and amend their mistake with a couple of DLC-based games that added the features fans were missing, it was clear that they were going to have to go back to the drawing board with their next numbered title. I'm happy to say that this turned out to be a wise decision because GTA V finally brought the fun back with them. Right off the bat, you can see that this game wants you to have some fun as it starts out with a prologue mission from nine years ago where a few criminals engaged in a bank heist gone wrong. 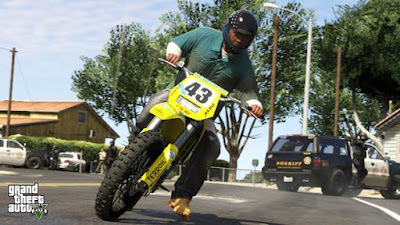 After two of the three are presumably shot dead, the third escapes into the wild before the scene switches to a small-time gangbanger and carjacker named Franklin in Los Santos of San Andreas. It doesn't take him long for him to meet one of the men that was thought to be shot dead and the one that got away, and there is the hook to this game. You aren't just controlling a single protagonist in this game. You get to play as three. Franklin, the man that's back from the dead in Michael, and the one that was able to escape into the wild in Trevor. The three aren't always going to see eye to eye, but they will have to work together in quite a few missions if they're to see things through to the end. When you do unlock other characters to play as, it's as simple as hitting down on the D-Pad and then a direction on the right stick to switch to another character on the fly. This can and will be done both in and out of missions in order to advance to the story. Each character has their own stats, cash, weapons and missions that they'll play through. They also each have a unique special ability that can be triggered by clicking in both thumbsticks. Franklin's an expert driver, so his move slows down time and lets you weave through traffic with less risk of crashing. Michael slows down time on foot as he's a firearms expert, giving you more of a chance to clear out any potential trouble. 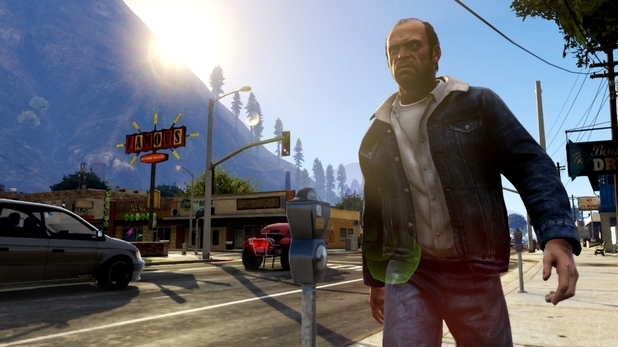 Trevor's ability is as psychotic as he is as he takes less damage while dishing out more while it's active. With the different abilities, Rockstar has amended one of the series' biggest problems to me since its 7th gen surfacing. That is that the variety in missions is back. So many times in GTA IV, I felt like it was drive to one location, shoot x number of bad guys, drive home. Very rarely did things ever break out of that mold, and it didn't help that the layout of the land was a flat, dull, and quite honestly, lifeless husk of a city. GTA V, even from the outset, gives you plenty to do. Storyline missions, races, random people and events that have you doing all sorts of things like driving, shooting, or finding items. Even better, you're free to explore the entirety of San Andreas' map right from the outset. No more having to wait for a random mission to open up another chunk of the map. Go out there and have fun exploring the whole state. It's a pretty interesting place, too, as Los Santos gives you your city environment, head on north to wind up at the countryside, and keep on going to visit either the desert or the game's two mountain ranges. More often than not instead of hailing a taxi and trip skipping to the next mission like I did in GTA IV, I found myself driving or flying off to the next mission myself because the world was an interesting place to explore. 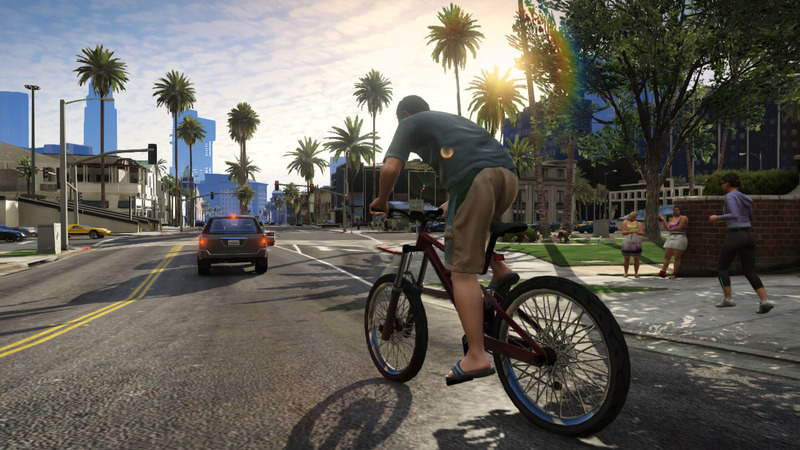 Riding a bike is just one way to boost your character's stamina. One of the other things that helps this game out is the characterization. You are not some criminal who is trying to get out of a life of crime by looking for someone or doing something for the right price that completely goes against said character's statements. No, you are playing as three dudes who know they are not perfect and even when the inevitable "I want to get out of this" stuff comes up, it makes sense as characters also know they can be hypocritical at times. While I could do without the random n-word and f-bomb droppings that many times just feel like they're thrown in to be thrown in, the writing does get pretty interesting when things do get more serious later on in the game. In many ways, it feels like an action flick that has its serious moments but also knows when to be silly... It's just that it goes overboard on the latter at times. greatest and most impressive looking games by far. The one thing that I'm glad is expanded upon from IV is the bank heist stuff. Even if you barely remember anything about the main game, most players that got far enough were rewarded to a bank robbery mission called Three Leaf Clover. In GTA V, there are a few of these kinds of missions and are known as heists. Instead of just having one way to do things though, players are given the choice of taking the subtle approach or the all up in your face one. Not only do you pick your plan at your meeting place, but you also pick your crew. Some of them are given to you right off the bat, others are found through random events in the game. Case in point, a certain dude that was in Three Leaf Clover shows up as a potential recruit in this game. Even better, you're also tasked to set the heist's plan up on your own. These tasks can range from stealing a vehicle in a stealthy manner to buying equipment for the heist. Whichever way you chose is the way things will play out. I always liked taking the subtle approaches to these missions as it felt like it was more interesting than just going in guns blazing, but the fact that they give you the choice is something that I appreciate. Wearing his helmet, Franklin is always safety first. The heists themselves are usually 15-20 minute multi-step affairs. The very first one had my crew hit up a jewelry story by using knockout gas to incapacitate the guards and workers there while by ground team hit the place and quickly took everything in there before the cops arrived. After that, we had a somewhat lengthy escape sequence that saw the team drive through the sewers to avoid the police. If at any point I was hit during this, some of the money from the heist would be lost, so it's not just a matter of getting out but doing so in an efficient manner. These missions were the most exciting part of a very good game to me. Meanwhile, Trevor is always psychotic. 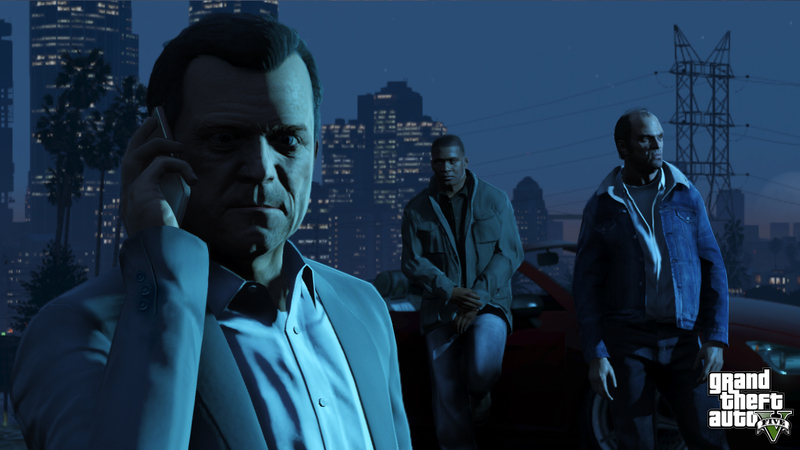 GTA V isn't without fault, however. In trying to go for 100%, there are a few tedious tasks in this game. Aside from a couple usual collecting quests that will have you going for a map, there are things like running in a triathlon. You have to complete three of these, and I don't have a problem with the first two, but the third lasts a good half hour. It brings back bad memories of titles like Vice City Stories where you had to do fifteen levels of many boring missions like the infamous ambulance helicopter. These stupid side quests required for 100% are far fewer in number, but the ones that exist try to pad out a game that really didn't need that kind of padding. Another issue is that the PS3 version I was playing on would sometimes be chugging along in terms of frame rate, or at times, not even loading the full map I was driving on. The latter happened rarely, but when it did, it made it tough to get away from the trouble I was in. I also had an instance where when coming back from the online mode of the game, which we'll cover in another review, where traffic would not load, making completing a mission impossible, and forcing me to have to back out of the game altogether to get things fixed. That said, the occasional glitch or bouts of tedium don't take away from the fact that Grand Theft Auto V is a pretty fun game from start to finish. Never did I feel like I had 30-40 straight filler missions as the plot remained focused not including all of the other tasks I could take in to get away from just rushing through the game. In fact, during my 60-hour+ run, I found myself enjoying the majority of it, something that's been rare for this series outside of a DLC expansion for me in the last decade. Grand Theft Auto V is truly the first time I can say the series has been this grand since the PS2 days of yesteryear. Good going, Rockstar. You finally figured it out again.